Where has the time gone? I am sorry I have been so quiet for such a long time – a small short list of excuses involve trying to sell / buy houses, visiting in laws, visiting friends, poorly parents and occasional sunshine and school fun! I guess I have quite simply been busy being one of the many women I last wrote about here! Do you forgive me? I hope so, it is weird dropping off the bloggosphere for such a long time, I totally lost my mojo and had a panic that I didn’t know what to write about and then we were rescued from a craftless month (it is really hard trying to keep a house tidy for viewing and do any craft!) as I hit birthday season for my family! 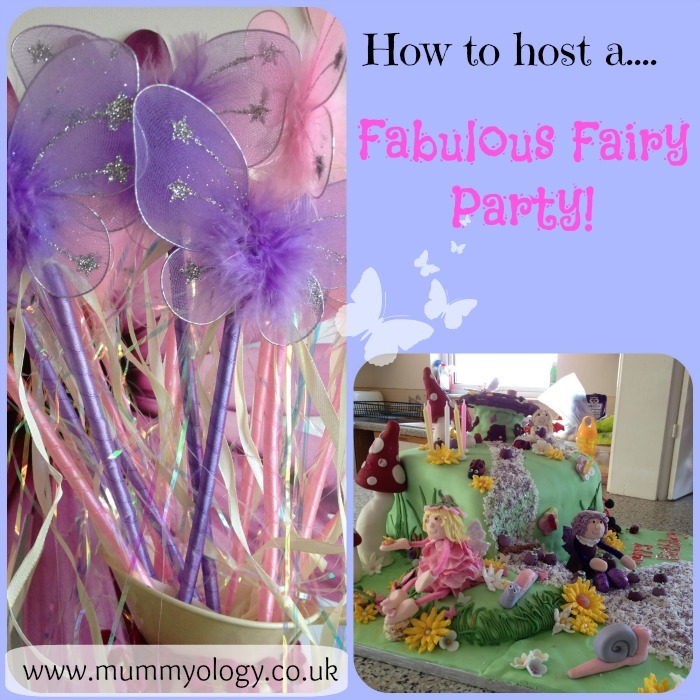 So, you are in luck – I finally have some fairy fun to tell you about…. My niece and my eldest daughter have both just turned five. My sister and I have two fairy fanatics between us so our theme was a no brainer and between us we have come up with and found some really neat ideas that helped to make the kids two parties really cute. One was a big party in a hall the other a smaller affair in our house, I’m no expert but we pretty much tried everything fairyish between the two events! Here is how we held our fabulous (and frugal) fairy parties! 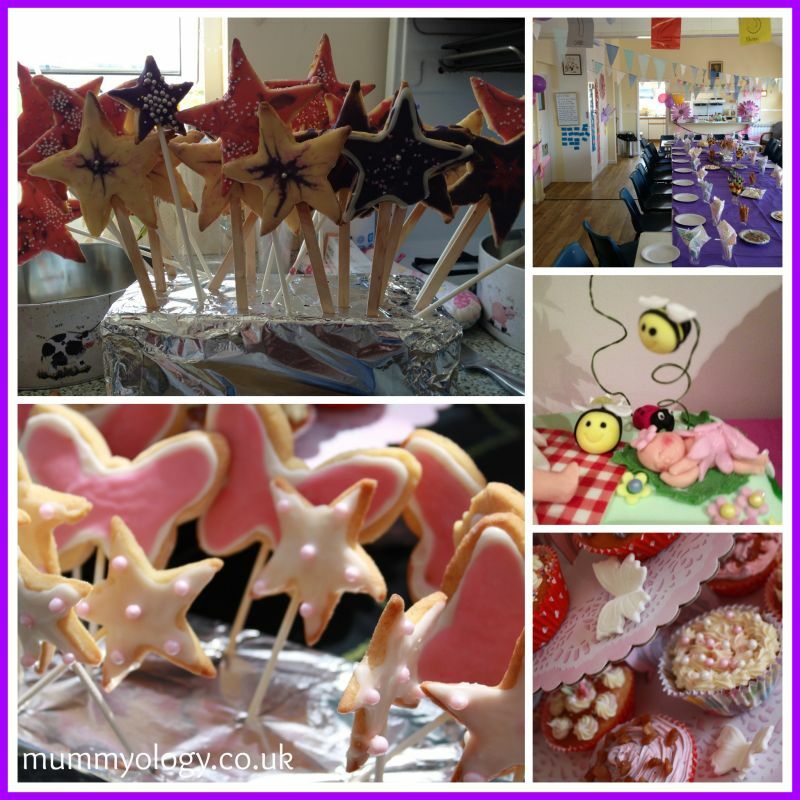 For me, planning kids parties should be broken down into different parts. 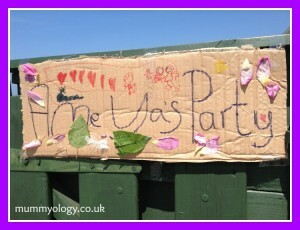 We had a really small budget for our party so chose to hold Beas party at our home (gulp!) My sister had a larger number of kids to deal with so needed to hire out a hall. She actually hired a local day care hall which turned out to be brilliant because it was really low cost, had a kitchen, some outdoor toys and of course all the facilities like toilets and tables and chairs were small and easy for the kids to use! Whatever you decide, make sure you weigh up the pros and cons of having a party in or out of your home – obviously space is an easy one – how many kiddos does your house have space for? Do you have outdoor space to ease the pressure on your party? How easy it is to move all the stuff you want to include in the party away from your home? Does the alternative venue have a kitchen you can use, tables and chairs, good parking? I also rolled out the miles of bunting I have. It is bunting with a tale to tell as it was first made for my wedding reception seven years ago by my parents and myself and has since been strung up at about 5 other wedding and countless birthdays. It was super easy simple bunting made with simple triangles of assorted blue and cream tule and other material, cut using pinking shears and sewn onto a tape. We then used a lot of our party presents (party loot I think you call it in the USA?) as the actual decor – more on this later. Also, a quick visit to our pound shop (dollar store) revealed a treasure trove of pretty little birthday banners and plain coloured table cloths. If you have pretty coloured table cloths then plain (cheaper) white paper plates and cups look good instead of boring! 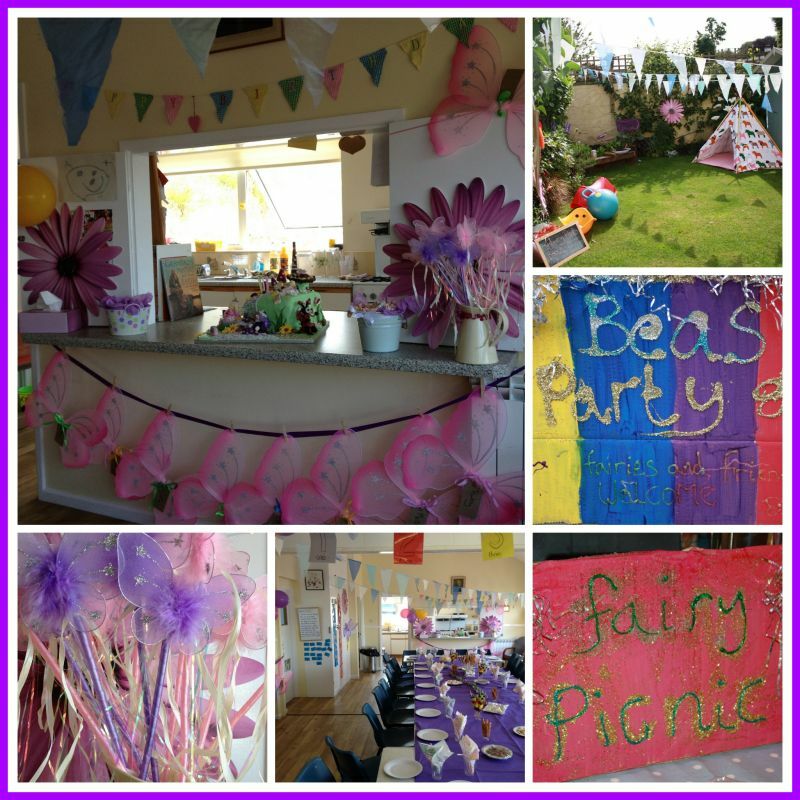 I also picked up some pretty garden decorations from the poundshop – giant butterflies and dragon flies really fitted the fairy theme and of course we got the birthday girls involved themselves, making signs and pictures for their big day themselves. 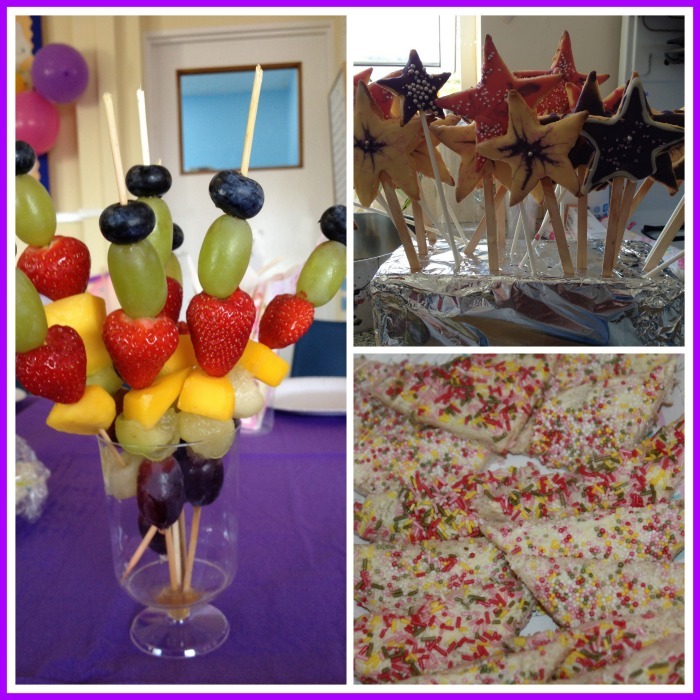 We basically accented each party with the kids favourite colours – one being purple and the other pink and rainbow colours. I couldn’t resist these cute coloured paper fans and I think next time I might have to try making some big tissue pom poms. I found this ‘how to’ guide on Pinterest here – imagine how beautiful they would look! Another idea is to simply look around your house and move some of your own pretty things into the limelight – put sweeties and party favours into a nice vase, use a pretty duvet as a throw over a sofa or table – the kids won’t know and it won’t cost you a thing! Balloons are also a favourite big impact, low cost item on my shopping list. Rather than spending a fortune on helium balloons, I got a bulk lot of balloon sticks and use these instead. Kids still love to take one home and they can be grouped together in an empty pitcher or stuck around the garden to brighten the yard up. I got these beautiful bright spotty balloons and they really help to turn a normal room into a party room! For me, party food is a bit of a double edged sword. Of course, it is a party so there should be treats and it should be fun BUT does that mean it has to be a load of rubbish laden on their little plates? 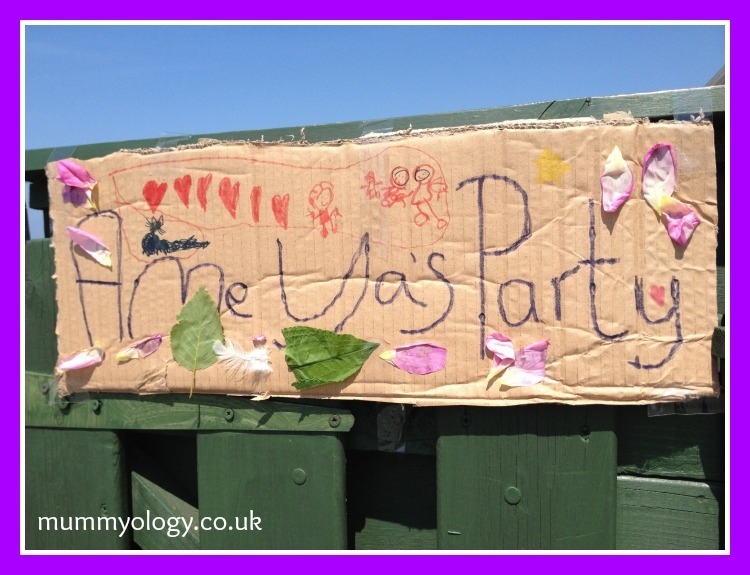 From my experience of these two parties and the other ones I have given and of course been along to in my childs life so far, kids LOVE party food, always grab a ton of the ‘naughty’ stuff and leave nearly all of it in the mad scramble to get down and have more fun. But if you make it look interesting, take the time to make your sandwiches into a different shape, cut up some veggies, have some dips, a few sausages if you fancy and a few small bowls of crisps if you want to serve them then the kids will take these with as much enthusiasm as they would have the rubbish stuff. Hold the sweet stuff back until after they have eaten some of the savoury so that they don’t stuff themselves on the wrong things first. For my nieces party, we were lucky enough to have use of their perfect little tables and chairs so the kids all sat down for party tea together and my lord, they ate a lot too! At ours, I stole an idea from a great friend of mine and got everyone little cardboard lunch boxes – they then all picked their fairy picnic from the buffet style table and ate it on rugs in the garden. Having the food in the boxes meant it was easy for them to carry around without losing it all at the first garden step and of course, it was different and exciting too! Here is our menu for the fairy picnic to give you some ideas! Fairy Bread – an aussie favourite we have adopted – basically just sprinkles on bread… its yummy and pretty! By far the surprise winner of the party food were the fruit wands we made. What is it about putting fruit on a stick that makes it so appealing?! The kids could not get enough of these simply made fruit ‘wands’. I simply threaded grapes, strawberries and blueberries onto a kebab skewer – you could also use melon, mango or pineapple. We literally had to stop some kids from overloading on fruit – when else have you had to do that?! I kind of feel I have waffled on enough for one post so will come back again soon with part 2 to cover the activities and games, loot bags, entertainment and all importantly THE CAKE! How to Create a Birthday Party to Remember How to throw a Peppa Pig Party Great Party Ideas for Tweens Seven simple seasonal crafts We believe in fairies 10 Top Tips…to help your kids to LOVE food Take one box and….. 10 ways to SPRING into SPRINGTIME! Is your summer salad making you fat?